For us the blizzard of 2010 was more roar than substance -- lots and lots of wind but only 6 inches or so of snow. Where was the two feet! We wanted more since we were snug in our home and not traveling. This is our first major snowstorm with Kodi (we adopted him in early April) and he LOVES snow. The roar of the town snow plow going by the house did made him bark in surprise, but once he saw the snow he pounced in joy. He raced around the yard with a big smile, like a kid on a snow day. 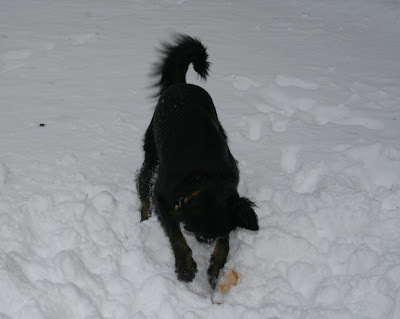 He buried his bone in the snow, then dug it out, then buried it again, then dug it out, and again and again until we went back inside. Although we did not get as much snow as some places, the wind arrived and stayed. The wind chill around mid-morning today was below zero. Kodi and I ventured out for walks in the woods - me with multiple layers of winter clothes and Kodi with nothing extra. He trotted and sniffed and wandered without a care for the temperature. Actually he seems to much prefer winter to hot summer days. Here he sits in the cold snow at the edge of a frozen pond chewing the stub of a tree. The twelve days of Christmas are not quite underway, although today I saw eight swans-a-flying. Okay, so not quite seven swans-a-swimming, but these were mute swans which I think is the featured species in the classic carol. Kodi and I were on our walkabout near the Exeter River when I heard a soft hum overhead. I was thinking a muffled flock of Canada geese, until I saw the eight swans with pure white bodies and incredibly long, graceful necks. Swans must be one of the most beautiful birds to see in flight and to see eight was a treat. According to the Sibley Guide to Birds, mute swan wings produce loud, resonant, throbbing hum in flight, unlike other swans. So, their wings make a singing sound -- maybe it should have been seven swans-a-flying. Something not quite so musical is that mute swans are considered a nuisance. Biologists all along the East coast treat them as a pest. Native to Europe and Asia, the mute swan has adapted well to the New World after it was introduced here in the late 1800s to grace lakes and ponds as a living ornament. Strongly territorial, mute swans aggressively defend their nest site from anything -- ducks and geese, humans, predators. Hence the concern that they drive off native wetland birds that are trying to nest in the same vicinity. Also, because of their large size they eat large quantities of aquatic plants, further impacting the habitat for native ducks and geese. Many state agencies work actively to reduce the numbers of mute swans. A common technique is to shake or "addle" the eggs in a nest, which kills the developing embryo and fools the swans into continuing to sit on the nest. It seems harsh perhaps, but the goal is to get the population size down to some equilibrium where it has less impact on native wetlands and bird life. If you are really curious about what states are doing related to mute swans read the mute swan management plan. As a biologist I think it is okay for states to control mute swans, just as many of us work to remove invasive plants. We will never get rid of every last buckthorn or multiflora rose or Japanese knotweed or mute swan, but we can control the spread of these exotics and provide room for native plants and animals to thrive. Still, maybe because it is the Christmas season, it was neat see those graceful eight swans-a-flying (as long as there are not too many more!). For more than a week the daytime air temperature has hovered at or below freezing. Then today, the first day of winter, the sun emerged and the temperature soared into the low 40s. It felt balmy, if for just a few hours at mid-day. The sun and warmer air melted most of the dusting of snow that fell overnight. Just when it seemed that lakes and backwaters were frozen enough to bear weight, they've opened up again. On my Solstice walkabout with Kodi the bit of fresh snow revealed many squirrel tracks. This makes Kodi's heart soar. He never catches them, but the chase is good exercise. Squirrels had a good 2010 with bumper acorn crops to eat and cache. A winter with fresh snow reveals many stories that remain hidden when the ground is bare. 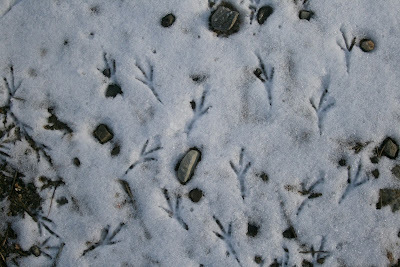 Birds too left their prints. 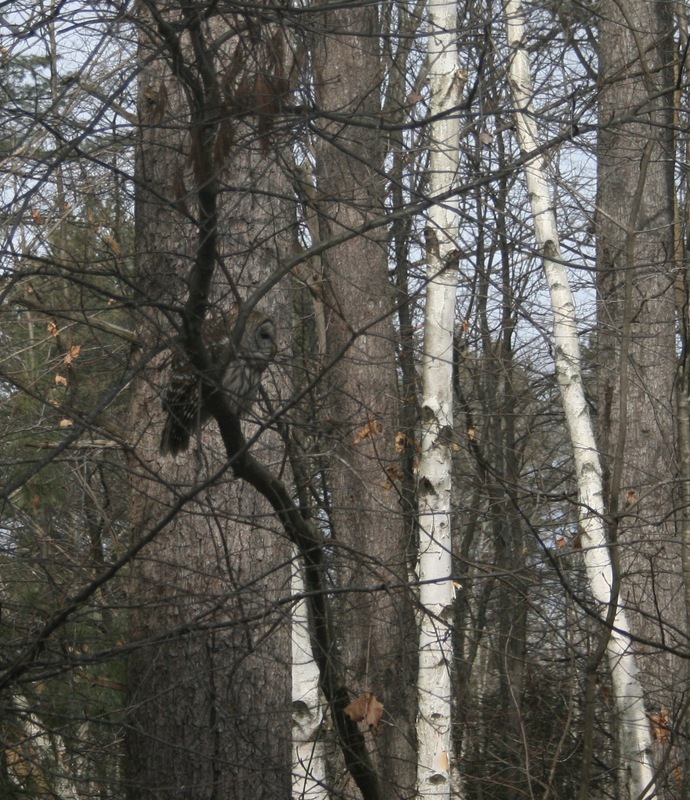 Up in the trees chickadees hunted for seeds and insects among hemlocks and alders. Two blue jays scolded a huge flock of starlings that landed in the bare canopy of three large oaks. Suddenly it looked like the trees had sprouted leaves, the starlings were so many. The blue jays were upset - that was their territory. The day is short and the night is long, yet it doesn't quite feel like winter yet. As the Solstice full moon wanes and the days grow longer after today, winter is just beginning. Let it snow. The sun is missing this Solstice Eve. past gray rocks and gray trees. Kodi finds only gray squirrels to entertain him. into the vast gray ocean beyond. The sky is gray all day. A cold, biting wind blows. 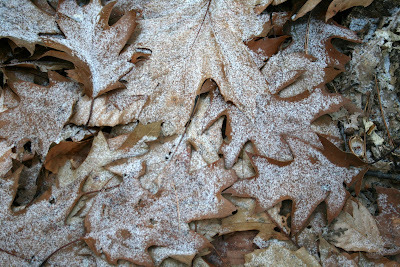 Snowflakes begin to fall one by one, then faster. just as afternoon fades into twilight. Earlier in the day on my walkabout with Kodi I was bundled up against the cold. The backwaters and the shorelines of the Exeter River were groaning as ice formed and shifted. Kodi paused to listen, wandering what animal could be making that noise. left them looking like sugar-coated Christmas cookies. This same equipment is used to clear vegetation beneath transmission lines. Power companies used to spray herbicides from helicopters up and down powerline corridors. Now they bring in the brontos instead, avoiding the widespread application of herbicides. The operators of these big rotary drum mowers -- we worked with John Brown, Inc. the company that actually invented the brontosaurus -- are so good that they can mow around and leave untouched a single blueberry bush or a tall hemlock tree. Here are two pairs of before and after pictures of the work this week. Our operator cleared nearly 5 acres in three different gravel pits in less than two days. Way more efficient than using a chain saw and at this size the trees have no economic value. Most of the land around this property is either developed or growing into mature forest. Animals that use clearings, old fields, thickets, or young forest are declining in the region, as their habitat is either developed or as forests grow back through natural succession. Human development patterns have squeezed wildlife into smaller fragmented areas and in some cases we have altered the pattern and timing of natural disturbances such as fires, windstorms, and beaver activity. At one time these disturbances would have created a patchwork of openings across thousands of acres; today we have roads, parking lots, stores, houses, and other paved surfaces instead of a natural clearing here and there. Hence our desire to create patches of habitat conditions -- such as these clearings -- that some wildlife still need, especially when we can do it in an area that was already disturbed. Snakes will bask in the newly sunlit openings and turtles will look here for nest sites. Red-tailed hawks will now hunt for mice and voles lurking among the coarse mulch spit out by the bronto. Fox and coyote will hunt the rodents too. During future growing seasons as plants re-sprout and insects emerge, more animals will visit the clearings in search of food: deer, turkey, woodcock, bluebirds, sparrows, butterflies and dragonflies, among others. In 5 to 10 years, trees and shrubs will be big enough to attract towhees and field sparrows and other shrub-loving birds. Sometime before another quarter century goes by the bronto may return to munch on the trees again, before they get too big for the clearing. I returned to the site on the second day of mowing to get a few photos of the bronto in action. I stood far enough away to avoid any flying bits of vegetation. I was mesmerized watching the operator manipulate the long-necked spinning drum with ease. Birches and pine trees alike disappeared in seconds. Here is a series of shots taken over just a few minutes. Watch the trees disappear. Come spring I'll be back there to see what emerges in these sunny openings. No sooner had I posted the last blog about the cold and the siskins, a barred owl flew into the tree just beyond the bird feeders! Now, this is why I work from home.... 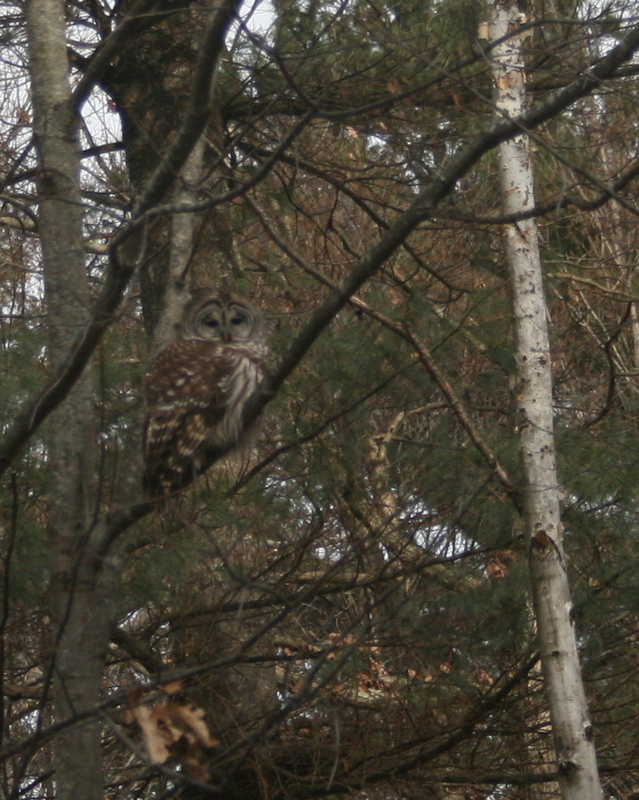 Here are a few pictures, admittedly poor, but they were taken through the window and the owl is a good thirty feet away. 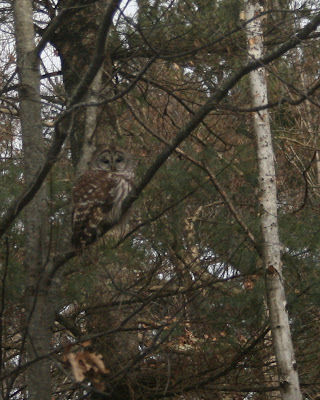 We often hear barred owls hooting from the woods behind, but this is the first time I've seen them in daylight in our yard. They are somewhat diurnal so not a surprise to see it out at mid-day. It seemed to be watching the backyard -- the wild meadow that we mowed this fall -- waiting for a vole to carelessly emerge from a grassy hideout. Seeing no movement, the owl flew into the back woods. I am extra thrilled about this because my 7-year old niece said she saw an owl near the bird feeders on Thanksgiving weekend. She is quite observant, but I was wondering if she mistook it for a Cooper's hawk, which we often see near the feeders, since I had never seen an owl so near the house during the day. Clearly my niece knows her owls and her hawks! 7.5 degrees Fahrenheit on the thermometer this morning; wind chill pushed the temperature below zero. Dry and cold -- not a drop of precipitation for an entire week. I would prefer some snow, but instead warmer temps and rain are on the way this weekend. The cold, dry air has brought goldfinches and pine siskins to the nyjer ("thistle") seed feeders. I just counted a dozen siskins at our feeders. Similar in size to goldfinches, siskins are brownish with lots of streaking and a hint of yellow in their wings and tail. You might mistake them for a sparrow. They are known as an "irruptive" winter finch because in some years they migrate farther south in large numbers to feed, perhaps when their own food supply in the boreal forest is in short supply. 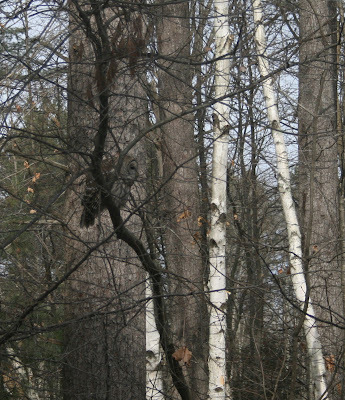 New Hampshire Audubon is predicting that pine siskins will "erupt" this year. And sure enough the siskins are showing up at the feeder. Three gray squirrels have congregated below the feeders to catch any seeds kicked out by the birds. The squirrel baffle is effectively blocking them from climbing up the feeder pole. On our walkabout this morning Kodi and I met up with a woman and three dogs. The four of them had a blast running together and seemed thrilled with the concept of walking on water (in ice form). Frozen ponds, icy waters, chilly winds, freezing temperatures -- the cold means nothing to these dogs. They just want to be outside tearing around in the woods together. 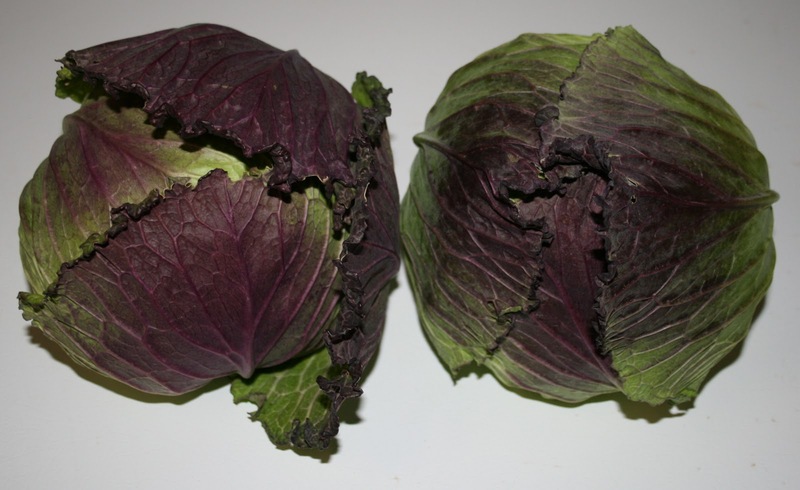 I posted a plant quiz last Wednesday on December 1st that you can see by clicking here. Today, below this picture of Kodi, I've posted the answers. But first, another correction to my clues. I used the word "native" too loosely; actually I should have avoided it all together. Several of the plants in this quiz are not native to our region, and one originated in Eurasia. A better descriptor would have simply been that I commonly see these plants on my walkabouts with Kodi. The black locust is native to Pennsylvania and parts south, but has become naturalized in our region. Common burdock is from Eurasia. The others are native, or at least have been here a long, long time. The wild cucumber (Echinocystis lobata) is unusual -- a vine-like plant that grows like a gourd -- but prevalent in one place we visit regularly. Look for future quizzes on the first day of each month. We spent the weekend hiking off the Kancamagus Highway. Before leaving home we checked the High Summits Forecast to determine where we might hike. The forecast said something about the models not lining up so they couldn't predict the track of a storm that might or might not drop 3 to 6 inches, with temperatures hovering at or below freezing. Given this uncertainty we chose low elevation trails and peaks off the Kanc. Our base of operations was a friend's cabin, sans electricity, off Bear Notch Road. Upon arrival at the cabin just as it was getting dark we turned on the propane for lights and the stove, primed the outdoor pump to get water for dishes and other uses, checked the mouse traps, fed Kodi, cranked the Greenplay hand crank radio to listen to NPR's All Things Considered, and started fires in the two wood stoves. The temperature inside was 38F, but warmed to 70F within an hour. By the time our friends arrived it was cozy and the lentil soup was hot. A light snow started falling before we went to bed. Saturday dawned cloudy and windy. Only a light dusting of snow fell overnight. After a drawn out breakfast of coffee, OJ, bagels and cream cheese, hot oatmeal, and cranberry nut bread (there might have been more items), three of us drove up to Lincoln Woods for a hike into Franconia Falls and Black Pond. This was an easy 8+ mile round trip hike on the Lincoln Woods trail along the west side of the East Branch of the Pemigewasset River. The trail follows the bed of an old logging railroad that was last used in the 1940s -- many hemlock ties and spikes are still in place. We passed a couple clearings that were sites of logging camps in years gone by. The Lincoln Woods trail reaches a long foot bridge across Franconia Brook in 2.9 miles. After walking the easy 0.4 miles up a side trail to see the Franconia Falls we returned to the bridge for a quick lunch -- a cold wind kept us from lingering too long. 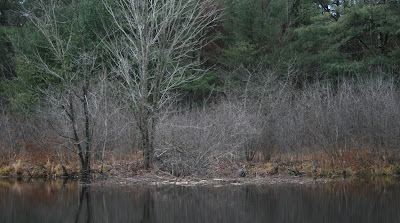 We retraced our steps down the main trail then turned right onto the one mile trail to Black Pond. This trail climbs a little to reach the pond, but is an easy hike and worth the walk in to the shore of Black Pond which offers a nice view of Bondcliff. Although the temperature was above freezing, it was a cold day to hike with a steady wind. We needed our winter wear, in part because the trails were so level that we never worked up a sweat. The light dusting of snow, thick bed of leaves on the ground, and a little ice made it a bit slippery in a few places, but bare boot was fine all weekend in the destinations that we chose. Back at the cabin Saturday night we stepped out to look up at a dark night sky full of stars. So many that it took a few minutes to find Cassiopeia in the Milky Way. We found the Andromeda Galaxy using binoculars -- a hazy patch nearly overhead between Cassiopeia and the Great Square of Pegasus. Jupiter shown brightly in the southeast sky. Sunday morning was calm and cold and overcast. This day we climbed Mt. Potash (2,670') -- a new one for us and a repeat for Dale. To avoid a stream crossing, which can be difficult according to the AMC guide, we started at the logging road about 1/2 mile west of the Mt. Potash trail parking lot. We passed a log landing with logging equipment (silent on a Sunday) and piles of logs; farther along we passed one of the recently created clearcuts. This area looks to be actively managed by the Forest Service. A hundred feet or so past the clearcut we turned onto the Mt. Potash Trail. We climbed through a northern hardwood forest -- the beech here were heavily damaged by beech bark disease; perhaps the reason the area is being cut over time. At about 1,700 feet the forest suddenly changed from hardwoods to a beautiful softwood forest dominated by large, mature spruce, with some hemlock mixed in. A maze of spruce roots criss-crossed the trail, providing good traction as we climbed, allowing us to avoid ice-covered exposed rock slabs. About half-way up, the trail follows the top of an exposed rock ledge with wonderful views to the southeast of Mt. Passaconaway, Hedgehog Mtn, and Mt Chocorua beyond. We reached the summit in about 1 1/2 hours, with one set of tracks in the snow our only human sighting on the entire hike. The hike to the top of Mt. Potash is an easy, excellent half-day hike. We were back at the cabin for lunch, finishing off some hot soup and chili and wrapping up our weekend at the cabin. Last month I posted a leaf quiz that several people seemed to enjoy. So, here is the next quiz. 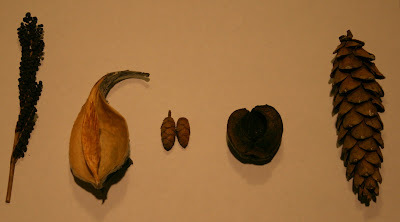 These are parts of seed pods, fruits, or cones that I gathered from plants around here in the last days as Kodi and I went on our walkabouts. Ten different native plants are included in the two photos below. One plant was actually new to me - I had not noticed it in my wanderings before and I had to look it up. A correction thanks to an alert reader: one of these is actually not native to New England, but it has become naturalized here and some do consider it invasive. I hope you enjoy -- feel free to leave a comment or ask questions. I can give clues, but not yet. I'll provide answers in a few days. Last night for dinner we took a break from turkey leftovers (yes, we still have some), going for a completely different taste with sushi and wontons. My sister rolled carrots, avocado, cucumber and sushi rice in sheets of Nori seaweed. These were topped with thin slices of pickled ginger and a dipping sauce of soy sauce, dry sherry, and scallions. I mixed up fresh pork from New Roots Farm with scallions, ginger, oyster sauce, soy sauce, and sesame oil for the wontons. We folded a tablespoon of this mixture into each wonton wrap. These were cooked in three different ways: lightly fried, steamed, and boiled. Boiled was the most efficient and easiest, although the fried wontons had a nice flavor, as fried things do. My niece was helping fold the wontons, until we noticed that it was snowing. Then she darted outside to the deck to make a six inch snowman......with the first snowfall of the year. The wind blew hard on Wednesday, the day before Thanksgiving. Hard enough that our power went out by 8:15 in the morning. That worried me as I was all set to bake cookies and rolls for the holiday. And what about roasting a turkey... Fortunately the power returned by late morning and despite wind gusts all day the power stayed on and Thanksgiving went off without a hitch. It was a cold, bracing November wind. Invigorating if you bundled up and stood against the wind. While the power was out Kodi and I drove to Durham and hiked out to a scenic point on the Great Bay estuary. Few other people braved the wind, except for two very hardy duck hunters perched off the point in a blind with a bevy of duck decoys floating just off-shore. The wind whipped up white caps all around them. I shivered and headed back inland. Over this Thanksgiving holiday we've eaten many hearty meals that included a homemade rhubarb pie that my 5 and 7 year-old nieces helped me make. The crust was perfect as was the rhubarb, which came from my parent's farm. To work off the meal yesterday we walked to a nearby conservation area. There we saw that beaver were also busy this week preparing for their winter meals. 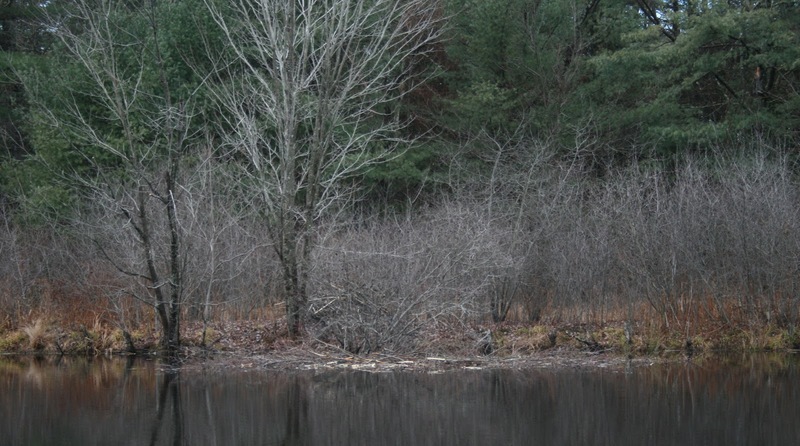 They were adding chewed branches to their lodge and stashing freshly cut twigs at the water's surface near the lodge entrance, where they can easily reach them from underwater once the pond freezes over. 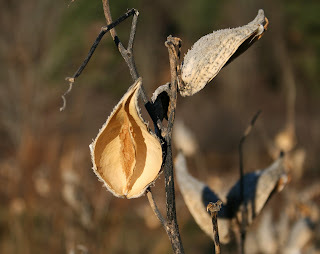 Milkweed pods stood empty in the field overlooking the beaver pond, their silky seeds blown free by the November wind. We walked home for another meal and another piece of warm pie.